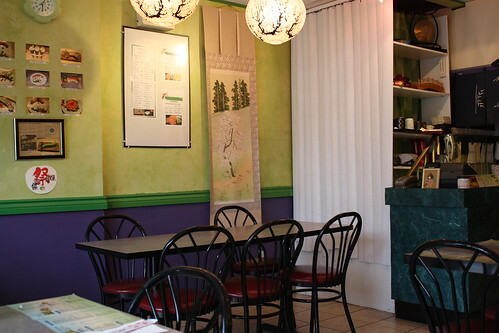 6.5 / 10The food and service were good – decor and ambiance need work. 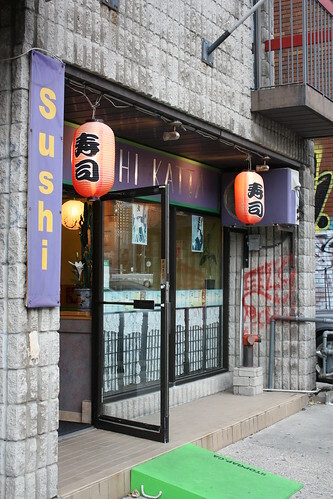 Soooo, my sushi eating friend here has a co-worker that recommended Oishi Kada in Kensington Market. We set a date and headed out, arriving around 6pm on a Monday night. Upon arriving, we were greeted right away. We were the only customers at the restaurant so we were seated right away. The place looked clean and tidy but the decor was a bit of a mishmash. The waiter brought us tea and asked if we wanted something else to drink. … And that’s when I found out there is no beer at this sushi establishment. Ice tea it is! After perusing the menu, we decided on the Salmon with Avocado Roll, Spicy Tuna with Avocado Roll, Unagi Roll and the Dynamic Roll (sprimp tempura, smelt roe, avocado, chef’s spicy sauce). As the waiter walked away with our order we realized that he was also the chef – a one man operation. It wasn’t long until we had a good looking platter of rolls in front of us. The rolls looked appetizing and fresh. Indeed… This guy did it all! I guess that explains the little headset ear piece he was rocking. Wondering what would have happened had the place been packed. Both of the Spicy rolls had the same spicy sauce (understandable) but I didn’t find them overly spicy. The Unagi was quite nice. 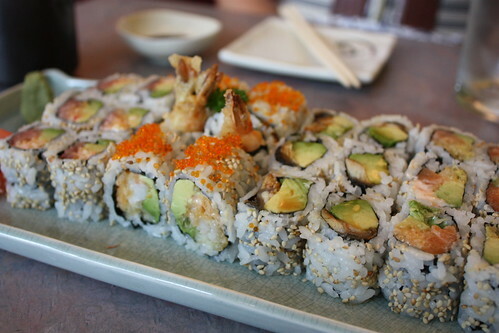 All three of these rolls seemed to melt in your mouth quite easily. The Dynamic roll was decent as well. That’s a really good word to describe the rolls – decent! They were fresh, flavourful and enjoyable, especially the Unagi – it did melt in your mouth. The Dynamic and the Spicy rolls were good too. … annnnnnnnnnd that was it. Our dishes were cleared and we asked for the bill. And waited… and waited… Finally a little stare down got him to bring us the bill. Language barrier? Possibly. True, you don’t get that nice dining experience of, say, a District or a Yuzu but it’s fairly typical for most little sushi places. The sushi was decent — If I had the hankering for sushi and I was in the hood, I’d go back to Oishi Kada. Would I make a special trip? No. I give Oishi Kada in Kensington a 7.5/10. What are your thoughts on Oishi Kada? Let us know in the comments below! So sorry to report that although this was one of my favorite places to nosh sushi, they have closed!